UPDATED: Wed., Jan. 24, 2018, 7:10 p.m.
Quite literally, Laura Stockton has a new view on life. 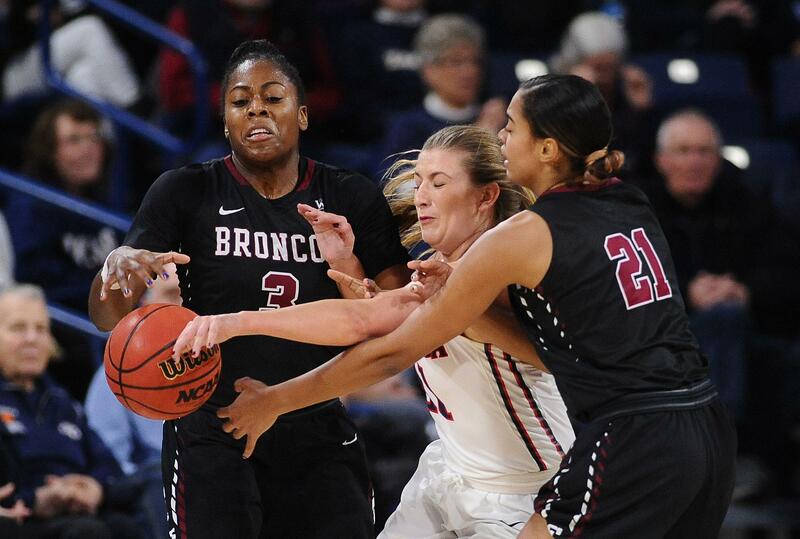 “I can actually feel the breeze on my face,” said the Gonzaga junior point guard, whose broken nose is healed and that pesky face mask a thing of the past. The view, however, is the same – Stockton and the Bulldogs are looking down at the rest of the West Coast Conference. “It just feels good to be playing so well right now,” Stockton said Tuesday as the Bulldogs (15-4 overall, 8-0 WCC) prepared for another frenzied week in the conference. This week it’s a home game against Portland followed by a plane ride to the Bay Area and a Saturday date at San Francisco. “It’s easy to say we’re on top of the conference, but being older, I understand how competitive this league is,” Stockton said. “Teams are coming after you and that’s when they’re going to have their best games. Then again, so is GU, which is two games ahead of the pack and riding a 10-game winning streak that dates back to mid-December. The Bulldogs are outscoring WCC foes by an average of 13 points while holding a plus-six rebounding edge and a plus-seven turnover margin. They’re also shooting 45 percent from the field. The only nagging worry is GU’s long-range shooting, which at 24.3 percent ranks 341st out of 349 teams in Division I. “We’ve kind of stopped worrying about it,” Bulldogs coach Lisa Fortier said, given her team’s overall success. “We’re kind of moving forward,” added Fortier, who pointed out that GU is focused on getting high-percentage shots all over the court. Playing to their inside strength, the Zags are taking fewer 3-point shots. Last year in WCC play, they took an average of 20.7 shots from beyond the arc. This year, they’re taking just 14.8, almost a 30-percent decrease. So far it hasn’t mattered against WCC opponents. “We’ve been playing good team defense, and offense as well,” said Fortier, whose team has forced 20-plus turnovers in the last four games. That trend figures to continue against the last-place Pilots (4-15, 0-8), who gave GU a decent game two weeks ago in a 70-56 loss in Portland. “They run a great offense, with great pace – they’re a team that’s trying to find a way to get over the hump,” Fortier said. That will be difficult against the Zags, who’ve won 18 consecutive games against UP since 2010. It’s GU’s second-longest active streak against a WCC team, behind the 21-game run against Loyola Marymount. Portland is coming off a three-point home loss to Loyola Marymount. Julie Spencer leads the Pilots with 12.3 points a game, just ahead of Darian Slaga’s 12.2. On Saturday, GU is at USF (9-10, 4-4), a team the Bulldogs beat 74-47 two weeks ago in Spokane. Published: Jan. 24, 2018, 4:39 p.m. Updated: Jan. 24, 2018, 7:10 p.m.